This barrier free shower line provides you with the best solution to the accessibility challenges that traditional curbed showers present. These showers assist you in staying at home by ensuring that you have the most accessible and safest composite shower product available. 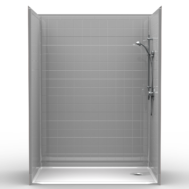 Because of low to no entry into our showers along with full plywood backed walls make these safe and easy to use. All of these multiple piece showers are designed for easy installation by using Bestbath’s exclusive snap joint technology. Several drain locations options are sure to match up with your existing plumbing reducing your plumber’s time and your costs. 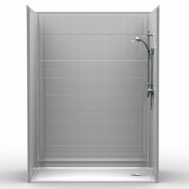 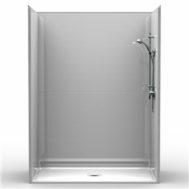 Best of all, we offer several aesthetic options that allow you to beautify your safe, accessible shower unit. 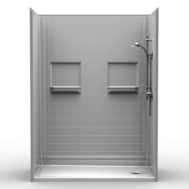 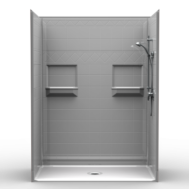 Yes you can customize your barrier free shower to match your specific bathroom décor. 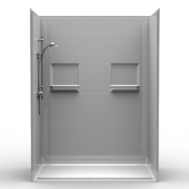 Bestbath Barrier Free Showers are safe, easy to install and beautiful.